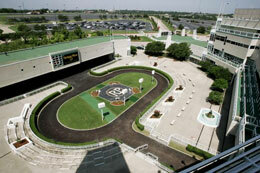 Remington Park canceled the final 11 races on their 12-race card Saturday evening program. OKLAHOMA CITY, OK—APRIL 13, 2019—Consistently heavy rains that started Saturday morning in Oklahoma City, forced Remington Park to cancel the final 11 races on the 12-race card Saturday evening program. "After meeting with the jockey's after the first race this evening it was decided that in the best interests for the safety of the horses and riders we would cancel the remainder of tonight's races," according to Matt Vance, Remington Park vice president of racing operations. "We will make up those 11 races later in the meet. We extend our sincere apology to our guests that braved the weather to come out tonight." The first race of the night was run over a sloppy track with temperatures in the low-40s and a cold northerly wind of 21mph. All wagers from race two and beyond were refunded. The Daily Double, 1 with All, paid $5.80. Banking On Kool, a 2-year-old Paint gelding, won the only race of the night. Racing resumes Sunday with race one set for 1:30 p.m. for a 10-race card.